This inspection and analysis of an existing facility consisted of needs analysis for renovation and additions, estimate of construction, development and project cost, estimate of operating revenues and expenses, identification of operational issues and procedures. The facility concept included three schemes. The rehabilitation of an outdoor 50-meter pool was selected. The re-design focused on maximizing entertainment value. The existing outdoor 6-lane, 50-meter pool was renovated to include a leisure pool with a lily pad walk, participatory play features, zero-beach entry, waterslides, six 25-yard lanes and a separate shallow tot pool. 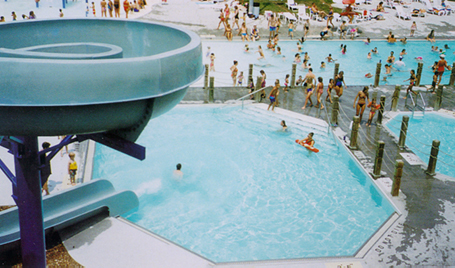 This pool opened in June 1994.